Forget candy — the real treat this year will be bright and colorful shooting stars. While Halloween is always magical, this year if you pay close enough attention it could be even more special than you’d expect. With The Taurids meteor shower being present throughout October you could notice quite a few shooting stars. Go spend an hour stargazing during late October and you’ll probably see an eye-catching fireball or two. These very bright meteors coming from the constellation of Taurus are known as the Southern Taurids, a long-lasting meteor shower that’s active from late September until mid-November. It peaks in late October when around seven or so shooting stars can be seen each hour. What are the Southern Taurids? A relatively minor meteor shower that officially runs from Sept. 23 until Nov. 19 in 2018, the Southern Taurids are one of the longest-lasting meteor showers of the year. It’s not especially prolific, but since they tend to be exceptionally bright “fireballs” that leave a visible trail as particles blast off the Earth’s atmosphere, the Southern Taurids are worth braving the cold for. What are the Northern Taurids? Overlapping with the Southern Taurids meteor shower is the Northern Taurids, another minor meteor shower that’s merely shifted a month later. Beginning on Oct. 19 and carrying on until Dec. 10, 2018, the Northern Taurids can also produce unusually bright shooting stars. What causes the Taurids meteor showers? Both the Southern Taurids and the Northern Taurids are the leftovers of Comet Encke, officially called 2P/Encke, which orbits the sun every 3.3 years. That makes it the most frequent comet in the solar system that we know of. As they get closer to the sun and warm up, comets tend to shed a lot of material, thus creating a stream of dust particles. If a comet’s path crosses the orbital path of Earth, there’s a good chance that Earth will later bust through that stream of debris. The result is shooting stars. Look skywards around midnight on Halloween. Since astronomers predict that there will be only seven or so (albeit very bright) shooting stars each hour, the best way to spot a Southern or Northern Taurid meteor is simply to go stargazing during mid- to late-October. Since the full moon — the Hunter’s Moon, or Travel Moon — will be bright and a major light-polluter on Oct. 24, that makes the week after ideal for stargazing. That’s Halloween. Although the bright shooting stars from the Southern and Northern Taurids meteor showers can be seen anywhere, both showers have “radiant points,” a precise place in the night sky where their shooting stars appear to have come from. Wherever you see a shooting star in the sky, if you can trace it back to the constellation of Taurus high in the southern night sky, you know it was a Southern or Northern Taurid (there are always other, random shooting stars in the night sky). The Taurids appear to come from close to the Pleiades star cluster, an unmistakably bright “fuzzy” patch of stars also called the Seven Sisters. When is the next meteor shower? Peaking on the night of Dec. 13-14, 2018 is the Geminid meteor shower, the biggest and most important of the entire year. Though it’s cold outside in the northern hemisphere and few stargazers get outside for long, it’s worth persevering for Geminds since they can produce up to 120 multi-colored shooting stars per hour. So if you’re trick-or-treating this Halloween, look skywards and you may just glimpse a super-bright fireball. Rainbows to the 5th order + other sky phenoms. Yes, here's the story of the dark matter hurricane -- a cosmic event that may provide our first glimpse of the mysterious, invisible particle. This one is for our currently MIA and Computerless Diner, AZ. According to a recent paper, the Earth is caught directly in the crosshairs of a cosmic hurricane. A swarm of nearly 100 stars, accompanied by an even greater amount of dark matter, is aimed directly at our stellar neighborhood and there’s nothing we can do to stop it; in fact, the vanguard is already upon us. But is it a danger? Well, actually, no. Not at all. But it’s potentially incredibly fascinating, with lots of interesting scientific interconnections. So, what is really going on? The story starts last April, when the Gaia satellite announced the locations and trajectories of 2 billion stars in the vicinity of the Milky Way surrounding our sun. They released the data to the public. Scientists were then able to look at the data set to see if they could spot anything peculiar. In galaxies like the Milky Way, the most common behavior is that the stars orbit the center of the galaxy in a manner broadly similar to the planets orbiting our sun. However, there are some stars that exhibit unusual motion. About a year ago, astronomers identified some “stellar streams” passing through our celestial neighborhood. One of them, called S1 (for stream 1), consists of nearly 100 stars of similar age and composition, orbiting the Milky Way in a direction exactly opposite that of normal stars. It’s kind of like a handful of cars driving the wrong way down the highway, except with a much greater distance between them and with no likelihood of a collision. These stars are spread out over a few thousand light years and they will pass through the solar system’s neighborhood over the course of a few million years. Astronomers identified S1 as being part of the remnants of a dwarf galaxy that collided with the Milky Way and was consumed in an epic episode of cosmic cannibalism. Dwarf galaxies are very small, typically about 1 percent the mass of the Milky Way. They can orbit larger galaxies and collide with the bigger galaxy, adding their mass to the parent. This is what appears to have happened in the case of S1, although the process has taken probably a billion years. Dwarf galaxies often have a disproportionately large fraction of dark matter. Dark matter is a hypothetical and still-undiscovered form of matter that interacts only gravitationally. Scientists have proposed its existence to explain many astronomical mysteries, for example the observation that most galaxies rotate faster than can be explained by the known laws of physics and the stars and gas of which they are composed. While dark matter has not yet been observed, hypothesizing its existence is the simplest and most economical explanation for myriad astronomical mysteries. Averaged over the entire universe, dark matter is thought to be five times more prevalent than the ordinary mass of stars and gas and planets. In dwarf galaxies, the fraction of dark matter is often higher. In Fornax, a well-studied dwarf galaxy orbiting the Milky Way, researchers estimate that the dark matter is between 10 and 100 times greater than the mass found in its stars. If that number holds for S1, the dark matter of the S1 stream is passing through the Earth at a much higher velocity than the more ordinary dark matter that orbits the Milky Way — about twice as fast. It is thought that S1 dark matter is flying through the solar system at a speed of about 550 km/s, or about 1.2 million mph. While these numbers are impressive, they are misleading. Dark matter, if it exists, is extremely diffuse and it will have no discernible effect on the solar system. Because dark matter hasn’t been observed yet, these velocity numbers are speculative, although they are strongly supported by a very large body of evidence. However, the prospect of high velocity dark matter flying through the Earth has suggested an opportunity to detect it. In a paper in the prestigious journal Physical Review D, researcher Ciaran O’Hare and his collaborators calculated the possibilities of discovering dark matter using both existing and proposed dark matter detectors. They considered two varieties of dark matter particles: a very heavy kind called a WIMP (weakly interacting massive particle) and a very light kind called an axion. Because the ultimate nature of dark matter is not known, it is important to be open to all possibilities. Experiments with names like ADMX, MADMAX and ABRACADABRA are able or will be able to search for the signatures of dark matter proposed in the recent paper. They consist of technologies that are designed to interact with axions in a strong magnetic field and convert them to ordinary microwaves or radio waves that can be easily detected. It’s important to remember that the S1 stream poses no credible threat to the Earth and humanity. There is no need for an action hero to save us. However, the synergy of science is staggering. A careful catalog of nearby stars has opened the prospect of a better possibility of finding and identifying dark matter, which is one of the great unanswered mysteries of modern physics. Artist's impression of an asteroid colliding with Earth. A large asteroid could be headed toward us in the near future — barreling through space on a risk trajectory that might cause it to collide with Earth. The news comes from the Express, which cites NASA sources revealing that the space rock could end up engaged in not one, but a staggering 62 different potential impact trajectories with our planet — each of them waiting to sling the asteroid toward Earth over the next 100 years. Known as asteroid 2018 LF16, the space rock was last observed by our astronomers on June 16 — notes NASA’s Jet Propulsion Laboratory (JPL) — who calculated its orbit and its potential to become a threat to our planet. The calculations showed asteroid 2018 LF16 could collide with our planet on 62 different dates between now and 2117. The first of these unnerving opportunities arises just five years from now — occurring on August 8, 2023. Other potential impact dates in the near future fall on August 3, 2024, and on August 1, 2025. In the last several decades, astronomers have confirmed a few thousand exoplanets, while there are still thousands more that are considered candidates. Astronomers discovered more of these planets that are orbiting distant stars, and on December 3, 2018, 104 more exoplanets were confirmed. And of those 104, at least 18 of them are less than two times bigger than Earth (but smaller than Neptune) and it’s believed that they have rocky compositions with atmospheres which are comparable to what we have right here on our planet. Those eighteen planets have little to no atmosphere which means that they don’t have thick or deep atmospheres like the ice or gas planets in our solar system. This means that they would have thinner atmospheres very much like Earth as well as other rocky planets, such as Mercury. A team of researchers at UK’s Durham University predict that another galaxy will collide with the Milky Way much sooner than expected, sending our Solar System hurling into space. “There is a small chance that we might not escape unscathed from the collision between the two galaxies which could knock us out of the Milky Way and into interstellar space,” Marius Cautun, a postdoctoral fellow at Durham’s Institute for Computational Cosmology, said in a recent statement obtained by Business Insider. We're not sure why, and it could already be over, but more stuff's hit the planet. Enlarge / The craters used for this analysis and their locations. How often does a big rock drop on our planet from space? As we've gotten a better understanding of the impact that did-in the dinosaurs, that knowledge has compelled people to take a serious look at how we might detect and divert asteroids that pose a similar threat of planetary extinction. But something even a tenth of the size of the dinosaur-killer could cause catastrophic damage, as you could easily determine by placing a 15km circle over your favorite metropolitan center. So, what's the risk of having a collision of that nature? It's actually hard to tell. The easiest way to tell is to look for past impact craters and try to figure out the frequency of these impacts, but the Earth has a habit of erasing evidence. So, instead, a group of scientists figured out a clever way of looking at the Moon, which should have a similar level of risk. They found that the rate of impacts went up about 300 million years ago. Some impact craters on Earth are pretty obvious, but erosion and infilling with sediments make others much harder to find. We wouldn't have noticed Chicxulub or the Chesapeake Bay Crater were there if we hadn't stumbled across them for other reasons. As we go back in time, plate tectonics can erase evidence of impacts from the sea floor, as the rock they reside in gets subducted back into the mantle. And then, about 550 million years ago, the Great Unconformity wipes off any evidence of impacts that might have been left on land. What could have wiped 3km of rock off the entire Earth? So, while we've come up with some rough estimates of impact rates on Earth, we don't have a ton of confidence in them. But there's a nearby object without all the messy issues of plate tectonics, sediment deposits, and erosion. The Moon obviously preserves a clearer record of its impacts and is close enough that it should have a similar impact history to Earth's. That's in part because whatever it is that knocks an object out of a stable orbit and sends it toward Earth tends to break it up, creating a collection of fragments that gradually find their way to the Earth-Moon system. It may take millions of years for them all to hit, but the hits on both bodies should show a similar increased risk of impacts. So how do you identify when impacts on the Moon happened? This is where the research gets very clever. The Moon's surface is covered with a carpet of dust called regolith, formed as rocks are broken down by small impacts and charged particles. But a large enough impact will blast away the regolith and spray out chunks of solid rock, essentially resetting the process. Over time, this rock will gradually decay to regolith, and the extent of the decay should be proportional to the time since the impact. Unfortunately, we probably can't convince China to send rovers to every crater to figure out how much regolith is there. So the researchers figured out how to do it remotely, using an instrument on the Lunar Reconnaissance Orbiter. It turns out that, during the lunar day, both rock and regolith get heated up by the Sun. Once the Sun sets, though, that heat starts to escape back out into space, where it can be detected as infrared radiation by the Lunar Reconnaissance Orbiter. But it escapes much more quickly from regolith than solid rock, meaning that, in the deep of lunar night, there's still heat escaping from rocky features, while it has mostly gone from regolith-filled ones. 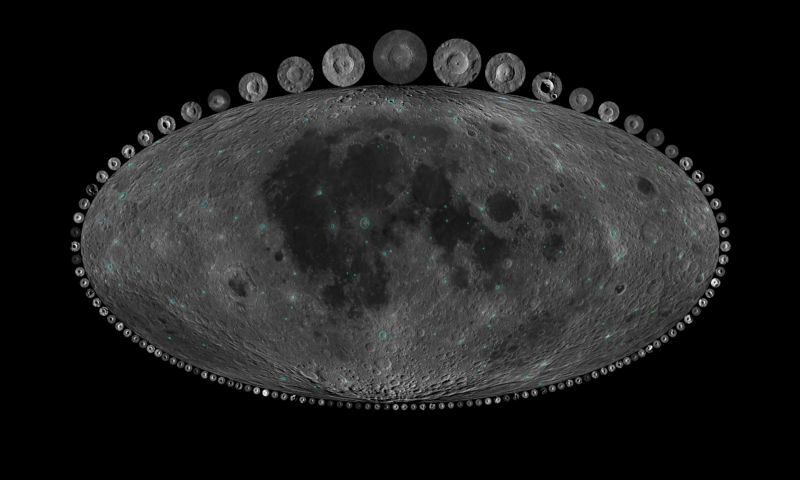 Starting with nine craters with known ages, the researchers confirmed that this is what we see on the Moon and calibrated the timing of the rocks' decay. They then used this scale to estimate the ages of craters over 10 kilometers. This, incidentally, indicated that the thermal emissions of a crater dropped to the regolith background in about a billion years. So, while we can't get a complete history of the impact rate, we can cover the Great Unconformity, as well as any recent changes. One thing that was clear is that the size of things hitting the Moon hasn't changed. The authors found that there was "no correlation between crater sizes and crater ages, meaning differently sized craters are randomly distributed in time." But the rate of impacts did show a shift at about 400 million years ago, at which point the rate roughly doubled. In other words, we face a much higher risk (though still extremely low) of seeing an impact than the trilobites did. Unfortunately, the uncertainty range was really large. The increase could be anywhere from 1.4x up to 20x, and its timing was similarly broad. So, the researchers turned to the Earth, performing a similar analysis using the age of craters 20km across and above. As expected, the Earth also saw a change in rate, and it was of similar magnitude to the one seen on the Moon. When the two rates are combined to a single measure, the uncertainties go down: the most likely date is about 290 million years ago, and the rate probably went up by 2.6x. The authors suggest that the increase could be the product of one or more large asteroids in the main belt, which could send smaller bodies out that create a small "wave" of arrivals lasting hundreds of millions of years. If that's the case, then there may only be a small population of bodies left in an orbit that puts Earth at risk of collision. Again, the risks are small, and doubling a near-zero risk still leaves it at near zero. But the results make it clear that our Solar System is an active place even billions of years after its formation. Science, 2019. DOI: 10.1126/science.aar4058 (About DOIs). I totally agree. They're are many more drive by's from space than in the past. Forget the arms race for a moment and consider what technology companies are doing to participate in the emerging space economy. From space tours to the implementation of 5G satellites, the final frontier for capitalism is outer space. So, naturally, tech companies are finding new ways to make space-related services valuable to the earth economy, and one of these schemes is selling ad space in the sky. Can you imagine looking up in the night sky to see a McDonald’s ad floating in light amongst the stars?  Magnetic north just changed. Here's what that means. While magnetic north has always wandered, its routine plod has shifted into high gear, sending it galloping across the Northern Hemisphere—and no one can entirely explain why. Magnetic north just changed. Here's what that means. The foundation of many navigation systems, the World Magnetic Model finally got a much-needed update with the end of the U.S. government shutdown. Magnetic north has never sat still. In the last hundred years or so, the direction in which our compasses steadfastly point has lumbered ever northward, driven by Earth's churning liquid outer core some 1,800 miles beneath the surface. Yet in recent years, scientists noticed something unusual: Magnetic north's routine plod has shifted into high gear, sending it galloping across the Northern Hemisphere—and no one can entirely explain why. The changes have been so large that scientists began working on an emergency update for the World Magnetic Model, the mathematical system that lays the foundations for navigation, from cell phones and ships to commercial airlines. But then the U.S. government shut down, placing the model's official release on hold, as Nature News first reported earlier this year. Now, the wait for a new north is over. The World Magnetic Model update was officially released on Monday, and magnetic north can again be precisely located for people around the world. Questions still likely abound: Why is magnetic north changing so fast? What were the impacts of the update's delay? Was there really a geologic reason Google maps sent me off course? We've got you covered. Earth 101 Earth is the only planet known to maintain life. Find out the origins of our home planet and some of the key ingredients that help make this blue speck in space a unique global ecosystem. Magnetic north is one of three “north poles” on our globe. First, there's true north, which is the northern end of the axis on which our planet turns. Get science & environment stories, pictures, and special offers. But our planet's protective magnetic bubble, or magnetosphere, isn't perfectly aligned with this spin. Instead, the dynamo of Earth's core creates a magnetic field that is slightly tilted from the planet's rotational axis. The northern end of this planet-size bar magnet is what's known as geomagnetic north—a point sitting off the northwest coast of Greenland that's changed position little over the last century. Then there's magnetic north, what your compass locates, which is defined as the point at which magnetic field lines point vertically down. Unlike geomagnetic north, this position is more susceptible to the surges and flows in the swirl of liquid iron in the core. These currents tug on the magnetic field, sending magnetic north hopping across the globe. “The north magnetic pole is quite a sensitive place,” says Phil Livermore, a geophysicist at the University of Leeds. What is the World Magnetic Model? To keep up with all these changes, the U.S. National Oceanic and Atmospheric Administration and the British Geological Survey developed what eventually became known as the World Magnetic Model, “so they would all be on the same map, essentially,” says Ciaran Beggan, a geophysicist with the BGS. The model is updated every five years, with the last update in 2015. Between each update, scientists check the model's accuracy against data from ground magnetic observatories and the European Space Agency's Swarm mission—a trio of magnetic-field mapping satellites that zip around Earth 15 to 16 times each day. Until now, this seemed sufficient to keep up with magnetic north's march toward Siberia. In the mid 1900s, the north magnetic pole was lumbering along at less than a hundred feet each day, adding up to less than seven miles of difference each year. But in the '90s, this started to change. By the early aughts, magnetic north was chugging along at some 34 miles each year. “Things are acting very strangely at high latitude,” says Livermore, who notes that this increase seemed to coincide with a strengthening jet in the planet's liquid outer core. Though the events could be linked, it's not yet possible to say for sure. By early 2018, scientists realized that the model would soon exceed the acceptable limits for magnetic-based navigation. Something had to be done before the model's next regular update, slated for 2020. Did the government shutdown upset navigation? To correct the model, NOAA and BGS scientists tweaked it using three years' worth of recent data. This updated version was pre-released online in October 2018. As Beggan explains, these include the model's primary users in defense and military—the U.S. Department of Defense, the U.K. Ministry of Defense, and the North Atlantic Treaty Organization. “Things are acting very strangely at high latitude." The government shutdown delayed the comprehensive public release of the information, which includes online calculators, software, and a technical note describing the changes. In principal, everyone who uses magnetic navigation could benefit from this update, says Arnaud Chulliat, a geomagnetist at the University of Colorado in Boulder and a NOAA affiliate who worked on the update. The model has found its way into many of our modern mapping systems, including Google and Apple, Beggan adds. But the difference is minor for most civilian purposes, and the changes are mainly limited to latitudes above 55 degrees. “The average user is not going to be overly affected by this unless they happened to be trekking around the high Arctic,” Beggan says. What caused all this weirdness? Interest in these unexpected jolts is about more than mapping. The dance of Earth's magnetic field lines presents one of the few windows scientists have to processes that happen thousands of miles below your feet. At the 2018 American Geophysical Union fall meeting, Livermore presented what he calls a magnetic field “tug-of-war” that may offer an explanation for the recent odd behavior. The north magnetic pole seems to be controlled by two patches of magnetic field, he explains, one under northern Canada and one under Siberia. Historically, the one under northern Canada seems to have been stronger, keeping the magnetic pole in its clutches. But recently, that seems to have changed. The Arctic: An Ocean on Top of the World Ice, wildlife, and adventure—that is what draws us to the icy waters sweeping down from the Arctic Ocean. Join the crew of the National Geographic Fleet to explore the northernmost part of the Earth. This may be a result of a jet within the core smearing and thus weakening the magnetic field under Canada, he says. The jet's increase in speed seems to have coincided with the last few decades of the magnetic pole zipping north. But he cautions about jumping to any definite conclusions. What's next for magnetic north? It's tough to predict what will happen to the magnetic north pole—or whether it's even going to maintain its speed as it staggers toward Siberia, notes Robyn Fiori, a research scientist with Natural Resources Canada. The only thing that seems certain about magnetic north is its unpredictability. Rocks hold geologic maps of even weirder movements of the magnetic poles, suggesting that in the last 20 million years, magnetic north and south have flipped places multiple times. This seems to happen roughly every 200,000 to 300,000 years. The exact causes behind these reversals remains uncertain. But the latest movement shouldn't have you in knots about an imminent flip. Models of magnetic north suggest that this latest leap isn't even the strangest thing the pole has done in more recent history, Fiori adds. Before 1900, its wanderings likely once had a lot more wiggle and may include several hairpin turns in northern Canada that could have sent the pole on a brief southward stint. “It all has to do with changes in the fluid motion of that outer core,” she says. It's therefore hard to say if magnetic north's newfound speed is the new normal. “We know that the pole now is moving faster than it has for decades, but how often does that happen in the long historical record?” inquires Geoff Reeves, a space scientist at Los Alamos National Lab. Editor’s Note: This article originally included a misstated quote from Robyn Fiori that has been updated.The types of navigation that can benefit from the new model have also been updated, and the spelling of Arnaud Chulliat's name has been corrected.